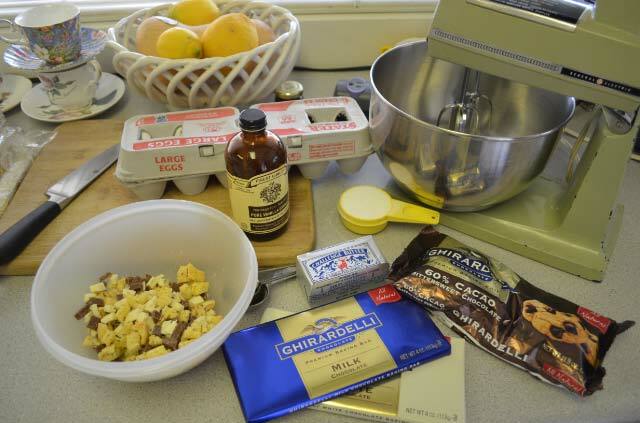 Tuedsays with Dori’s (TWD) recipe for our second week is, Chocolate Truffle Tartlets, Baking with Julia, page 382 &383. 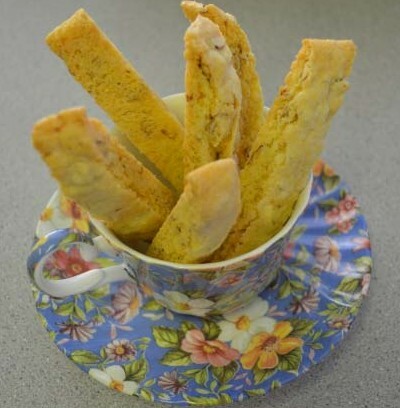 The recipe calls for biscotti, so my first task was to bake the biscotti. Since this is Tuesday’s with Dori, I turned to another of Dori’s books, Baking – from my home to yours for a biscotti recipe. This was the book for the first go round of TWD. I chose Lenox Almond Biscotti. As I wasn’t a part of the first TW D group, I went back and read some of the posts about this recipe. A lot of the bakers didn’t like the addition of the cornmeal in this recipe, but I actually liked it. It added crunch. I love the wonderful almond flavor. You can find the recipe in the book on page 141 or on the host blog post for TWD, October 14, 2008. Now, back to the Tartlet–the recipe looked intimidating, but it really wasn’t all that bad. I started the crust in the food processor, but I think it would have been just as easy to do it all by hand. Smearing the dough across the work surface with the heel of your hand really turned the crumbly pile of flour and butter into dough. I chilled the dough overnight and rolled it out and baked the crusts the next day. For the filling I used Ghirardelli Bittersweet chips and then used Ghirardelli Milk and White chocolate bars chopped to add with the biscotti. Because the biscotti was large, I only used three. 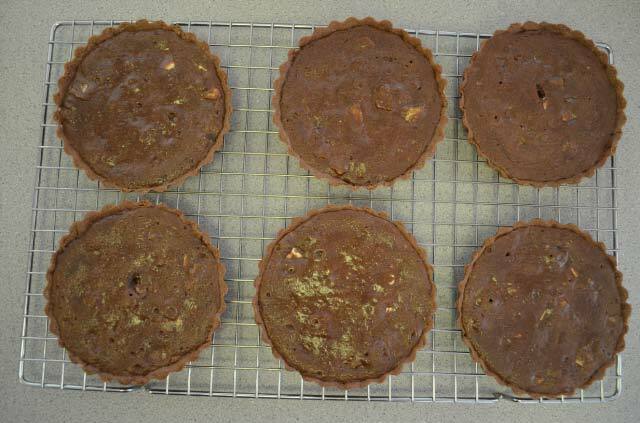 The filling was easy to make and I had just enough for my six tartlets. I did bake them just a bit longer, maybe 15 minutes instead of 12 because I was testing the center of one of the tarts to make sure it reached 160 degree requirement suggested by the USDA for egg yolk safety. They had actually reached 165 degrees when I took them out of the oven. You can see the holes where I tested two of them. The taste is wonderful! It is quite rich and I am sure would be even better served with a scoop of vanilla ice cream. My husband and I only ate one tartlet. Five of my girlfriends and I were celebrating one member of the groups 60th birthday with dinner at PF Changs. So I individually wrapped the other five tartlets and gave each of them one to take home for dessert. I am pretty sure I will make this recipe again some time for a special occasion. The crust was wonderful and could be used with many other wonderful fillings. I loved the small tartlet size. It’s just perfect for a small dessert for two and makes a great gift for those who just want a little something sweet. 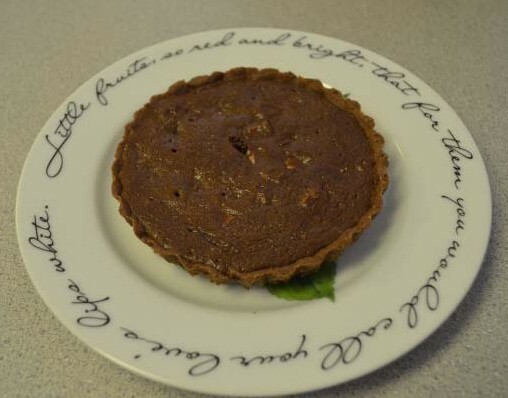 If you would like to make this lovely tartlet and don’t have the book, the recipe can be found on the one of the host bloger’s sites —Jessica, Spike, Jamie, and Steph. Carlene’s tartlet was smooth and creamy, with just the right amount of crunch from the biscotti. After Carlene shared her creations with us, I went home and immediately tried it. The only thing missing was sitting down and enjoying it with a cup of decaf (with my friends)! All the flavors blended well together and it wasn’t too sweet or rich. 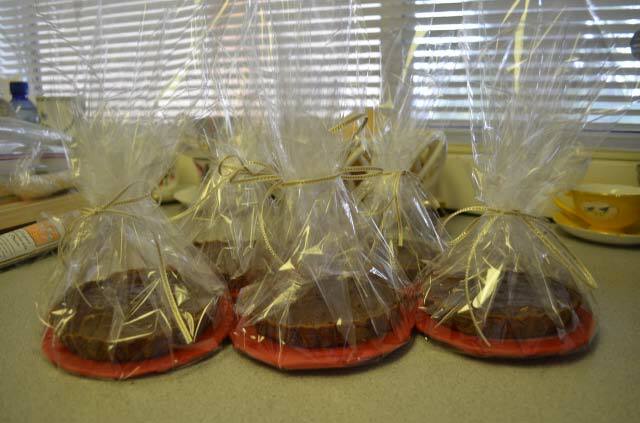 Over the years, there really isn’t anything that Carlene bakes that isn’t flavorful and leaves you wanting more! Love the plate with the inscription…pretty. Your tart came out great! Take home packets! How fun. Perfect little birthday nibble.